While the structural elements of a building determines its strength and durability, the finished surfaces convey the look and feel that the building owners are looking for. 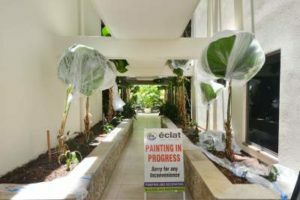 Painting is therefore one of the most important aspects of any building work whether it’s a residential renovation, a retail facade or the reception area of an upmarket resort. While painting may seem like a straight forward task, the reality is quite different. Different surfaces require different preparations, heat and humidity play havoc with any surface that has not been treated correctly and the quality of paints can vary widely. Different paints require different application techniques and careful thought needs to be given to the intended use of the area to be painted. Don’t let the most important visual element of your building be compromised by substandard or inappropriate painting work. Talk to Éclat about visually brilliant painting.